Whether if you’re a college student looking for a new, exciting, and affordable subscription box or if you’re a parent or friend that wants to surprise a college kid with a value-packed monthly gift box or care package, there’s an awesome subscription box out there! Below, you’ll discover some of our favorites that you can join this semester! Here are the best subscription boxes for college students that’ll help make this semester even more awesome. Plus, there’s even some pretty killer discounts and coupons that you can take advantage of! What it costs: £24.99 a box. What’s inside: With Unibox, you’ll get a college lifestyle box of 2-4 full sized useful items like vitamins, shower gel, travel mugs, and more, as wells as 3-4 snack and drinks that will help you channel that brain power. Why it’s awesome: Tt’s a pretty cool box that actually sends you useful stuff that you’ll actually need in college. What it costs: $19.50 a month. What’s inside: With Love with Food, you’ll get a box of 16-20 delicious snacks all of which are either all-natural, organic, gluten free, or GMO-free. Why it’s awesome: With each box purchased, Love with Food donates 2 meals to hungry children in America. Coupon / Buy Now: Get 25% off your box HERE. What’s inside: Each month, you’ll get a package of 3 clothing items based on your style profile such as a shirt, pants, and an accessory. Why it’s awesome: No better way to stay looking fresh than getting awesome clothes based on your style delivered straight to your door. What it costs: Starting at $29.99 a month. What’s inside: When you join Candy Club, you’ll get a box of delicious candies, sweets, chocolate, and other goodies based on your preferences and favorite tastes delivered straight from your door each month. Why it’s awesome: There’s literally no better way to put a smile on your face. What’s inside: With your Birchbox, you’ll receive 5 high-quality beauty samples based on your beauty profile and preferences. Why it’s awesome: One of the coolest boxes to try new, innovative beauty products. Plus, there’s even a separate box for men! What it costs: $49.99 a box. What’s inside: With FabFitFun, you’l get a seasonal box of full-sized premium beauty, cosmetic, and other popular lifestyle items. What it costs: $7 – $14 a month. What’s inside: Get a box of their famous coffee and espresso delivered straight to your door every month. Why it’s awesome: Blue Bottle has a cult following so you MUST check them out! Plus, it even makes a great gift for teachers and professors! Coupon / Buy Now: Get a free sample today HERE. What it costs: $29 for the first month. What’s inside: With Vinebox, you’ll get hand-selected wines by the glass delivered straight to your door. Why it’s awesome: Vinebox is one of the cooler wine subscription boxes mainly because you get wine by the class as opposed to bottles. 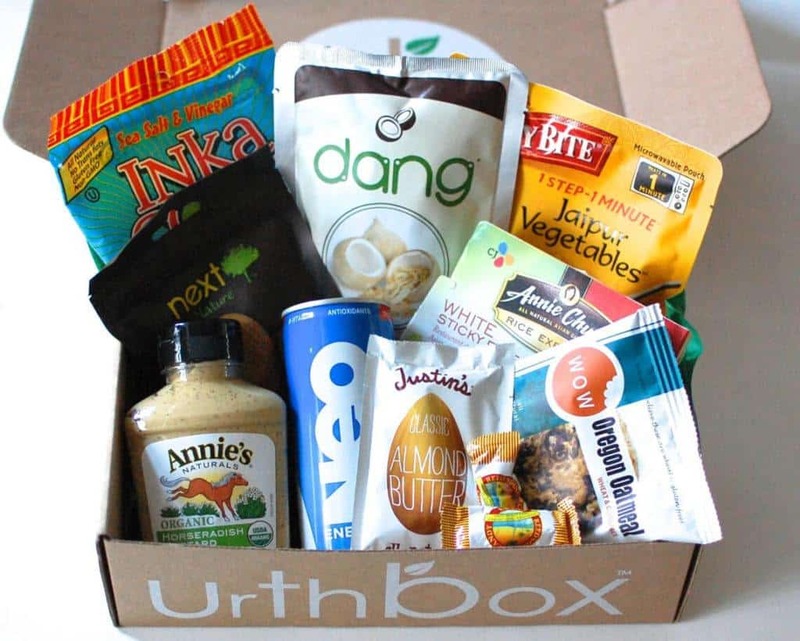 What’s inside: With Urthbox, you’ll get delicious, healthy, and organic goodies delivered monthly. Coupon / Buy Now: Use the code Urbantastebud to get $10 off HERE. What it costs: $15.99 a month. What’s inside: With a Loot Crate subscription, you’ll get a box of awesome fandom items like comics, collectibles, apparel, and so much more from popular geeky franchises. Why it’s awesome: Every month features a new theme which usually revolves around any upcoming blockbusters or events. It’s great! What it costs: Free membership with bottles starting at $13 a bottle. What’s inside: Get a box of wine based on your flavor palette. Just fill out 6 questions about your favorite tastes and you’ll get awesome wine recommendations. Why it’s awesome: Full bottles of amazing wine, rosé, and so much more at a low price. What more can you ask for? Coupon / Buy Now: Get $20 off your first order HERE. What’s inside: With Play! you’ll get a monthly box of deluxe beauty product samples straight from the Sephora store shelves. Why it’s awesome: The best way to try some of Sephora’s hottest products before buying. What it costs: $49.99 a week. What’s inside: When you join Freshly, you’ll receive chef prepared, healthy, gourmet meals delivered to your door weekly. But the cool part about Freshly is that they use only the freshest ingredients that are free of any reigned sugar, gluten, or artificial ingredients. Plus, it’s never frozen! Why it’s awesome: There’s no need to cook with Freshly, just pop them in the microwave for 2 minutes and that’s it! What’s inside: Get awesome and unique phone cases delivered monthly. What it costs: Starting at $9.99 a month for 1 book. What’s inside: Get interesting, new releases based on your book genre preferences delivered straight to your door each month. Why it’s awesome: Forget textbooks, these books are better. Coupon / Buy Now: Join the club for only $5 HERE. What’s inside: With a LOLA subscription, you’ll get a box of toxic-free organic cotton feminine products like pads, liners, or tampons for that time of the month. Why it’s awesome: So cheap, affordable, and safe to use. What it costs: $10 a month for 1 pair. What’s inside: With Odd Sox Sox Box, you’ll get a highly customizable box of bold and uniquely designed socks every month. Plus, Odd Sox even features some pretty killer collaborations between some of the biggest brands like WWE, Cartoon Network, Pepsi, and Nickelodeon, just to name a few. Why it’s awesome: There’s no better way to stand out than with these bold socks. What it costs: $39.95 and up per cube. What’s inside: Inside each CampusCube care package, you’ll find healthy, delicious, fun, and useful items perfect for dorm life. Why it’s awesome: There’s a cube for all types of things such as exam survival, birthdays, and more. What it costs: $19 – $39 a month. What’s inside: With Bokksu, you’ll get 18-20 handpicked premium snacks that people in Japan actually eat. Not that novelty stuff. Why it’s awesome: If you’re addicted to trying new and exciting Japanese snacks, then this box is great. What it costs: $8 – $24 a month. What’s inside: With a Harry’s shaving subscription, you’ll get high-quality yet affordable places delivered straight to your door, as often as you’d like. This is one of our favorite boxes for teens. Why it’s awesome: The best shave club when it comes to quality and affordability. Best of all, you can try it for free. What it costs: $54.94 for 2 meals with the 2 person plan. What’s inside: When you join Blue Apron, you’ll receive a meal box of original and season recipes as well as fresh, measured ingredients curated by renowned guest chefs and Blue Apron’s culinary team every week. Why it’s awesome: Perfect for anyone that doesn’t feel like eating at the dining hall. What it costs: $44.95 a month. What’s inside: When you subscribe to Yogi Surprise, you’ll get anywhere between 6 and 8 yoga lifestyle items all of which are also vegetarian-freidnly and GMO-free. Why it’s awesome: You get awesome yoga inspired products every month. Coupon / Buy Now: Get 15% off with the code YOGILOVE when you join HERE. What it costs: $30 a month. What’s inside: Every month, you’ll get an assortment of 7-9 healthy snacks as well as some great wellness items that are perfect for college kids. Why it’s awesome: It’s the perfect box for parents and family members that miss their college kids. What it costs: $14.98 a month. What’s inside: With a Squix subscription, you’ll receive a box of 3 full sized cleaning products of which you can pick and choose form over 75 different options. Why it’s awesome: This box is perfect for keeping your dorm room or apartment clean without breaking the bank on cleaning supplies. Coupon / Buy Now: Use the code KeepItCleanUB to get a free trial box HERE. What it costs: £15 a month. What’s inside: With Muscle Crate, you’ll receive a monthly fitness box of over 12 supplement samples. Why it’s awesome: Since college is the best place to workout, this box hooks you up with plenty of new and exciting supplements to try each month. Hopefully you find the best subscription box possible that meets all your needs. So whether if you’re a college kid looking for a great monthly box to join or if you’re a parent, friend, or fellow student looking to send a monthly care package, these boxes are sure to please! On the Yoga box, there is a misprint on the price. It is 44.95, not 4.95.